Amazing Elastic Plastic is back! Create fun, exciting balloons that LAST! Amazing Elastic Plastic is back! 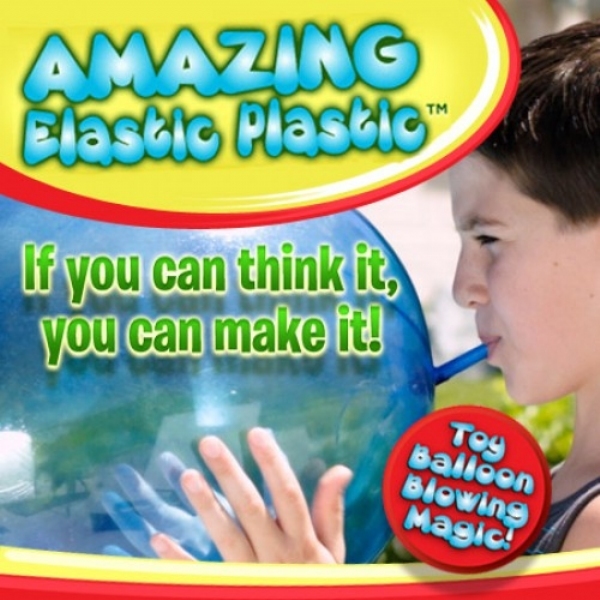 Create fun, exciting balloons that last way longer than regular balloons with Amazing Elastic Plastic as seen on TV. Ordinary balloons go pop but not Amazing Elastic Plastic. Just roll it, stick and blow, blow, blow to create endless shapes. Makes giant balloons or funny figures - if you can think it you can make it. Amazing Elastic Plastic is resealable so you can put a secret message or small toy inside. The perfect way for family and friends to play together. Makes a perfect holiday, birthday or "just because" gift. Kids love it! Ages 6+ Includes 1 red, 1 blue and 1 green tube with matching blow straws. Wooowee, these things stink only slightly less than before. We had a blas playing with this stuff for hours. The bubbles don&apos;t last long, nor do they easily stick together. However, it&apos;s a childhood memory we had to make. These balloons are pretty amazing. I was able to blow them quite large, larger than I&apos;ve ever blown before. They are durable though they tend to deflate quickly. However, product was not sticky and although it had some odor, it wasn&apos;t as strong as those I&apos;ve played with as a child.